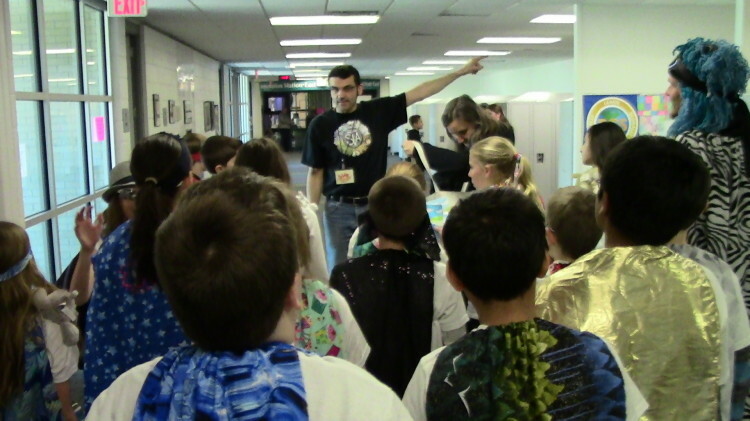 For Secret Missions, heroes traditionally explode into unsuspecting classrooms, offices, and lounges to actively share their superpowers with younger or older students, classmates, teachers, and staff in their own school. For the first time ever in the history of Superhero Training Academy, Secret Missions went beyond school, district, and township into the complete unknown when Deerfield superheroes got on a school bus in their capes and ended up at Covington School in front of 4 classrooms of students their age that they had never seen in their life. When they first went in, they were nervous, even afraid. “It’s scary at first, when you go into the unknown… we had ants in our pants,” said Fire Ninja afterwards. “I went WAY out of my comfort zone…I was so nervous. I was just really scared,” said Sweet Faun. But they got into their MegaSuperSquads, encouraged each other, gave last suggestions, and took the leap. Then, they started demonstrating superpowers. Mighty Mystic, who puzzles through problems to invent solutions, takes Covington students through a discussion of how they can contribute to solving global warming. Lightning Ninja, who is more outspoken than a thousand howler monkeys, more playful than a baby kitten, and more dependable than a mother to a cub, surprises with the light of laughter through play, puppets, and pretend. Leopard Star, who explores the natural world and discovers how animals feel and communicate, works with Billy the goat to lead Covington students in a joyful dance while her MegaSuperSquad beatboxes for support. Covington students were inspired and some imagined themselves as superheroes. “I would be Imagic, because I use my imagination in cool ways, maybe bring it to life and share it with others,” one said. “I would be Smart Wolf and […] would help animals find their way back home, and I would also share things because wolves always share their meals even with the smallest people in the pack.” said another. “My name would be J.R. Jokes and I’m gonna be the joker of all things. Whenever someone is sad, my mind pops in 100 jokes per second!” said a third.